Do i believe anything anymore? Yes i do. I believe in the wonders of science, and it makes me happy! My supernatural and spiritual beliefs have gone through many phases. I was brought up Christian and i believed unquestioningly. The idea that my parents could be wrong was unfathomable to me. In my late teens i read “Conversations With God” by Neale Donald Walsch and turned to more esoteric beliefs, ideas like: we’re all equal with God, we are creating our own reality as we go along, there is no absolute right or wrong, only that which serves us and that which does not. I ceased to believe in the devil and hell. On holiday in Budapest in 2007 i came across the book “The Whole Shebang” by Timothy Ferris. I began reading it in the bookshop and i was drawn in straight away. Although quite an old book, it gave me a glimpse of the wonders of the universe, and a taste for science. I borrowed many scientific books from the library and i really enjoyed learning the things we can know about our world and this universe. My opinions on God at this point were mostly agnostic. I didn’t feel any real need to contemplate anything spiritual when i had so much of a scientific nature to think about. I wouldn’t say i disbelieved in God at that time. However, on two occasions i felt myself craving the kind of unquestioning belief in God that i had during my childhood. I suppose i missed the feeling that God was a friend whom i could trust. I thought that i had drifted away from God and it was my responsibility to go back. I tried returning to church, but on both times i very quickly found that my ideas had changed so much, i could no longer blindly accept what i was being told by the church. On the second attempt, which lasted about two months, something finally pushed me over the edge. I was standing at the front and someone was praying for me to receive the Holy Spirit. I really wanted to be able to give up rational thought and just entrust myself to God … but nothing was happening. The longer this went on, the more embarrassing it became. I remember that something suddenly just clicked. I thought to myself, “I don’t think there is a Holy Spirit!” and immediately all these spiritual beliefs just tumbled down like a house of cards. I walked out effectively an atheist. The first thing i did was read “The God Delusion” by Richard Dawkins. I needed to understand how my parents could believe something so strongly, if it wasn’t true. Dawkins explained to me the evolutionary advantage to believing what you are told, the power of group reinforcement, the self-delusion of only noticing things that support your beliefs while ignoring things that don’t. I learnt not to pity my parents for believing what they do, but i was no longer under the hold of their convincing influence. I was free to think for myself. For a while i was a militant atheist. I think i rebelled quite hard against organised religion. Since then i have mellowed out a bit. I currently consider myself a humanist: i am more concerned with human welfare than i am with anything supernatural. All of this is a prelude for what i really want to write about. Most people will have figured out that i no longer believe in God, and i have put aside all my supernatural beliefs, having become skeptical about anything that requires discarding rational thinking. I’ve not written about this in such detail before because i’ve had no need to. I try not to interfere with other people’s beliefs unless i can see that it has the potential to directly harm somebody. My dad and my stepmum are still firm Christian believers. My mum is mostly interested in new-age spirituality. I was quite hurt by the question, do i believe in anything anymore? This is my response that i would have written in an email, but i decided it needed to be shared more widely than just with my mum. I have come to believe in many wonderful things. Things that i knew very little about before i started reading and educating myself in science. Beautiful fascinating processes that can be explored, tested and verified. Things like evolution, natural selection, quantum physics, cosmology, the big bang, deep space, the fundamental forces of the universe. Most importantly of all, i believe in the scientific method. It starts with producing a theory to explain the things we see … but unlike mythology and religion, it doesn’t stop there. It goes on to make predictions using the theory. Experiments are performed to test the predictions. Those experiments are repeated and verified by many people, and not just those with a particular interest in showing the theory to be correct. Any contradictions are welcomed and celebrated because it means the theory can be refined to become more accurate. This process never stops, and our knowledge about what is real gets more and more accurate over time. I don’t specifically disbelieve in reincarnation, but i find it unlikely. You can make nice stories about it, which may be comforting to some people, but for me there is little point in dwelling on the theory since it makes no predictions that can be tested and verified by experiment. I prefer to spend my time finding out as much as i can about things that we know to be true. Science has led me to believe that the most likely thing that will happen when i die is that i simply cease to exist. My body will decay and my consciousness will end there. 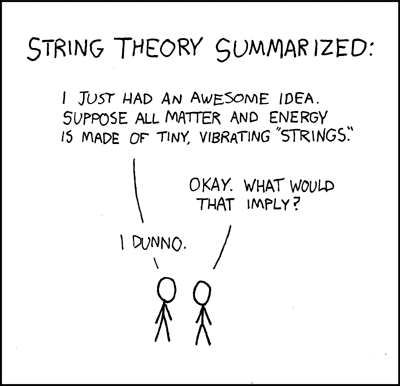 Occam’s Razor tells us that given two possible theories, the simpler one is likely to be correct. I am not at all saddened by this conclusion, because there was no emotion or wishful thinking that got me there. It only makes me all the more eager to enjoy this one life that i know i have. Of course i recognise that people like to believe their loved ones live on, and they may receive comfort from believing they are still in communication. I don’t really see anything wrong with that. I think of it more as recalling the memories of what those people were like, rather than their souls actually being present. Since there is no discernible difference in experience, it doesn’t really matter what you believe is going on. My journey of belief has shifted so dramatically in my lifetime so far. I would be foolish to assume that i have arrived at my final understanding. I accept that my beliefs will continue to adapt, but i suppose that from here on they will only change when presented with evidence that causes them to be reassessed. So, for example, if anyone can provide me with firm evidence for reincarnation, i will gladly accept it to be true and update my beliefs accordingly. I am happy in my current understandings. I actually find that scientific knowledge is far more reassuring to me than any spiritual hypothesis ever was. If anyone is unconvinced of the comfort that believing in science can bring, i recommend this wonderful video by Phil Hellenes: This Remarkable Thing. I’m reading a book called “The Goldilocks Enigma” by Paul Davies. It discusses why it is that the universe seems to be so finely tuned to life. It explains all the ‘coincidences’ that have turned up in cosmology and quantum physics, the constants that we experience such as the strength of gravity, the size of protons, the power of the electromagnetic force, etc, and describes what would happen if they were slightly different. The book has pointed out the one glaring exception to the “principle of mediocrity” that says the universe is pretty much the same wherever you look: the exception being that we are here and we have never yet observed intelligent life elsewhere! Why should that be? It continued by covering in detail the theory of multiple pocket universes, perhaps an infinite number of them, creating a collective multiverse. I am just coming on to the part about simulated universes and whether we would even know if we were in a simulation. All this i find very fascinating. One thing made me stop and think this morning. It was just a little aside to another point the author was making. I’ll quote the context and bold up the bit that interested me the most. While the simulation argument was restricted to a single universe, it was always possible to wriggle out of the uncomfortable conclusion that this might be a simulation by arguing that no civilizations are likely to reach the point of achieving such stupendous computational power. For example, there are many reasons why humanity may not survive for more than a few centuries beyond the present, and that may not be long enough for conscious computers to be developed. If a similar fate were to befall any other intelligent beings who might be located elsewhere in the universe, then simulations, while still a possibility in principle, might never be achieved in practice. Paul Davies, The Goldilocks Enigma, page 208. There it is. Just a little snippet with no elaboration. Just a cold hint that our species might not be around for very much longer. A footnote references “Our Final Century” by Martin Rees. I think i should read that book soon! The reason it caught my attention is that i have been thinking for a while that we might be heading for an early demise. A point made in “Conversations With God” is that our technological advances have now exceeded our sociological development. We have the ability to annihilate our entire species (and many of the others) if we misuse our technology. The scary thing is, all it takes is a few wrong decisions by a minority of people with great influence. Look at the Iraq war. I was one of 36 million people[citation] who protested against it before the war began. It did no good. We couldn’t change the minds of the people who decided it would happen. If it’s not a devestating war it’ll be run-away climate change, or over-population leading to world hunger, or an asteroid will hit the planet and wipe us out. In the long-term i think the only way to ensure the prolonged survival of our species is to spread ourselves out across other planets in the galaxy. Of course, eventually we would have to do that anyway: in 5 billion years time the sun will run out of fuel. But how soon can we start migrating to different planets? Current estimates suggest not very soon at all! This is the first hint i’ve come across that says our time left could be measured in centuries. In “Stardust”, Stephen Welch says that the average life-span of a land-based species is 5 million years. We humans have only been around for the last 200,000 years. It’s a terribly young age for a species to die! But if we are wiped out, what happens next? I believe that life will go on in some form. Life is very resilient, once started, it’s very hard to kill it. No matter what happens to the planet, even if we can’t survive, something will. But then what of all our culture, our literature, our art, our technology? Everything that we’ve produced will eventually fade and crumble without us here to preserve it. Does that matter? Wouldn’t it be a shame if another intelligent species were to come to our planet in a million years’ time and find no trace of our existence? What are we really trying to achieve here, anyway? I mean really long-term. Eventually our entire universe will freeze out as the last stars extinguish all the available fuel. We know that the human race cannot survive indefinitely, at least, not unless we can figure out a way to jump to a different universe, all of which (if they exist at all) are probably receding from us faster than the speed of light! Even if we put our consciousness into a simulated reality, it cannot outlast the life of the universe. Everything needs energy, and the second law of thermodynamics will be our ultimate downfall. “The Last Question” by Isaac Asimov, written in 1956, makes this point profoundly. It’s a good read; i enjoyed it recently. Ah, where am i going with this? I know we as a species won’t last forever, I don’t want our entire existence to be meaningless in the end but i can’t work out what it would take to make it meaningful on a cosmic scale. I think that a few hundred years is not a long time for homo sapiens to have left, and i hope we can get past our selfishness and childishness. I hope that our final end isn’t caused by our own silly fault. Today i should probably do a few more chores. I did quite well yesterday considering i was very not in the mood for cleaning. Nye’s Top tips for a tidy home were very helpful to me, as was Songbird in finding me some high-energy techno, combined with the MyChores lucky dip feature, and bribing myself with the promise of chocolate biscuits! I look forward to seeing what happens on MyChores today. In past years, January 1st has been one of the busiest days of the year! Approximately a year ago, you may have wished me a happy 2008. If you did, thank you! I had a pretty awesome year! Reading back in my blog, it feels like a long year. In fact, i noticed a stark contrast between the two halves of the year, pivoting on the moment i got my new job. I was amazed by how much of a difference it made in my perception: the first half of the year feels much longer than a year ago, but everything since my new job feels very recent. Yet the two halves are separated by just one weekend! I also noticed how many more blog posts i made in the earlier half of the year compared to the latter. So it’s new year’s eve again, the time when i get all retrospective and nostalgic. I actually quite like staying in on new year’s eve and blogging. Here is a summary of the year. 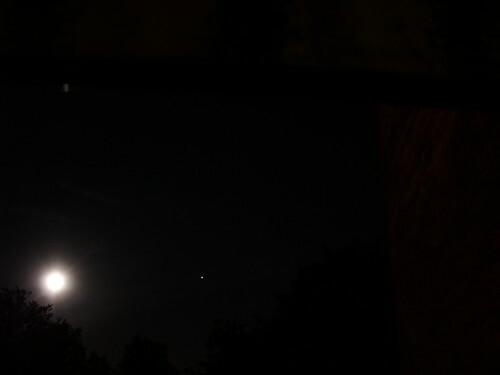 The camera is a total sham when it comes to photographing stars and planets. Wherever you are tonight, look at the full moon, and have a look for Jupiter too. It is beautiful. I wish i had some good equipment for viewing and photographing such spectacular celestial sights. This is about the best i could do. Tomorrow i’ll try photographing earlier in the evening, when it might come out better. There are estimated to be 1022 stars in the entire universe. That’s ten thousand billion billion. That number of grains of sand would cover the entire United Kingdom to a depth of several centimetres. Yet a single cube of sugar contains more atoms than stars in the universe! I read it this morning in Antimatter: The Ultimate Mirror by Gordon Fraser. Let’s blow ourselves up for an alien to marvel at! Today i am mostly doing chores, getting ready for a day off tomorrow. We’ll be going to London for lunch with a friend, and then to a workshop about Jewish people and their non-Jewish partners. Last night i was investigating the Universal Life Church. It is a church that was started by Rev Kirby Hensley in 1959 after becoming disappointed with the Pentecostal church. The difference with this church is it accepts absolutely anybody: of any faith or of no faith. All are welcome! Another cool thing: anyone is welcome to become ordained as a minister in the Universal Life Church, simply by asking to be. I think i might just do that! Okay, it’s treated as a joke by many people, but some people take their ministry very seriously. For me, it is just the kind of church that reflects my beliefs: everyone is special, every faith has something great to offer. No particular way is any better than any other way. 1. I believe that religions are tools … useful ways of finding and connecting to The All In All. 2. I believe that no religion has everything right, except perhaps for one which acknowledges that all religions have something precious to offer. Here is an email i just sent to my mum. I have just caught a glimpse of something so exciting! It’s wacky and crazy, about parallel universes and how we move through them, but i think it actually makes sense! Unless it doesn’t. Which entirely depends on which universe you are about to experience yourself in …!!! In some parallel universes you are about to click the “Read more” link! Are you going to move into one of them? !